Automated controls are expensive to buy but cheaper to operate. What is automated climate control? 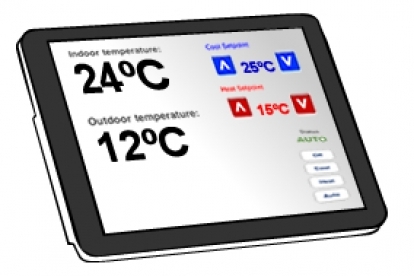 Automated climate control refers to systems that help to automatically regulate heating and cooling in your home. Automated climate control can also help you to save energy by only heating and cooling the rooms that you're using, at the times when you're using them. With automated climate control you can also either pre-heat or pre-cooling your house before you get home, using an interface on your smart phone. How does automated climate control work? Automated climate control systems rely on timers, sensors, thermostats and automated controls to make sure that the temperature is always where it needs to be. Timers and sensors ensure that climate control systems are only active when they need to be - either when conditions outside are either too cool or hot, at certain times of the day, or when movement is detected in a particular area of your home. To adjust the temperature, a control system then communicates with either a heating system or an air conditioner to raise or lower the temperature. Because home automation and building management systems are so versatile, you can also use servo motors to control your curtains and ventilation systems based on the season, time of day, the amount of light that's available or the temperature. This has obvious advantages, particularly in places like Melbourne which often experience all sorts of weather extremes in a single day. Curtains, shading and window controls are a cost effective but often overlooked method of automated climate control. Because heat is often lost or gained through windows, things like curtains, awnings, blinds or retractable shades can make a significant difference not just to the temperature, but also to the demand for air conditioning or heating.